As I am sure most of you all know, Viktor Orban is the amazing prime-minister of Hungary; he and his Fidesz Party just won an astonishing victory in their last national election, back on April 8th of this year; not only did he win his third consecutive term as prime-minister, his fourth term overall, but he and his party won a super majority in parliament, which along with the so-called far-right Jobbik party represented 70 percent of the vote; it was just an absolute and total repudiation of the political left in Hungary. And so, Viktor Orban is at the center now of putting forward a vision of what Europe will look like after the European Union basically collapses, or at the very least, when the European Union is taken over and redefined by a renewed nationalism that is sweeping the continent, which of course, may happen sooner than any of us thought, with the inevitable demise of Angela Merkel’s pro-open borders government in Berlin. As we argued before, when Berlin falls to Austrian-inspired, Hungarian-inspired border control, which is what it’s doing right now as we speak, when Germany institutes the very border security and immigration policies of Central Europe, the whole globalist multicultural project of the EU is effectively over; it is done. And that is in fact what appears to be happening right now before our very eyes. So, Viktor Orban, who of course has been on the front lines fighting Brussels now for several years, he has been delivering a number of speeches with a single theme: we are on the verge of a Central European renaissance, and it is this renaissance that will serve as a magnificent model for the rest of the continent in a post-EU political order. The speeches that he has been giving go back to 2016 as I understand it, in one of his visits to Poland, Hungary’s great historical ally and brother-nation of over a thousand years, where he began laying out what he saw as a roadmap for making Central Europe the single most successful region in Europe and indeed the world. 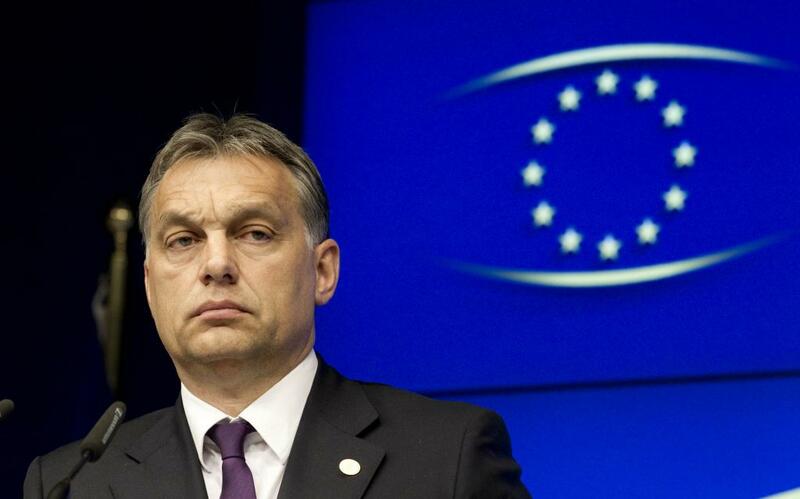 And in characteristic Orban fashion, he said that there is no point in aiming for a lesser goal. Now at the heart of this renaissance, Orban argues, is a return; Europe must first and foremost return to its Christian and classical roots. This is what makes Europe Europe. A uniquely European civilization is, by definition, rooted in a distinctively classical and Christian vision of life. It is from here that we derive our notions of the absolute and innate dignity of the human person, of the humility rooted in our shared fallenness and futility, and, most importantly, the notion of the centrality of infinite and eternal love at the heart of divine life that is the source of our hope and our redemption.This is the redemptive source of a distinctively European literature, art, architecture, music, poetry, politics, economy and overall vision of life. This emphasis on a return to the classical and Christian source of European civilization is what we call ‘retraditionalization,’ which is a rather simple but very, very profound and relevant concept. In the face of threats to a sense of place, identity, and security so often posed by globalization, people around the globe are more and more reasserting their historic identity and culture – their religion, customs, and traditions – as mechanisms of resistance against secular globalization’s anti-cultural, anti-traditional dynamics. What we are seeing throughout the world is a mass rebellion against this modernist experiment known as globalization and its secular aristocracy in the form of retraditionalization, and this is precisely what Viktor Orban is saying here; in order for Europe to effectively counter the culture-draining dynamics of globalization, it is going to have to return to the civilizational grounding of its historic roots as the primary means by which Europe’s customs, traditions, and cultures are protected as paramount to a flourishing humanity. For Orban, central to this retraditionalization is a return to the traditional family. Viktor Orban hosted the international meeting of the World Congress of Families last year, and he has often stated that Hungary in particular and Europe in general has to experience a revitalization of the traditional family in order to counter the demographic and fertility implosion that has plagued Europe for the last few decades, I would argue as a direct result of globalization. And so Orban and other nations have begun taking measures to help revitalize the family; he has implemented a housing grant and other subsidy measures to help support and encourage large families. Poland, as well, has been implementing similar measures, and has recently reversed Poland’s alarming demographic decline over the last several years. This, by the way, is one of the major achievements of the governments in Poland and Hungary in just a matter of a couple of years, and it will have profound ramifications for their flourishing for generations to come. For example, in just the last two years, Poland has gone from one of the lowest birth rates in Europe to one of the highest, literally in just a matter of months. They were in 20th place among European repopulation statistics in 2015. Today Poland ranks fourth, just behind France, Austria, and of course, Hungary. And notice, that three of those four nations today have right-wing, conservative and pro-Christian governments. These nations now represent double the repopulation average of European Union nations. THIS is what returning to Christian roots is all about. It is an absolutely astonishing reversal of European demographic decline which is a direct result of the anti-cultural processes of globalization. Secondly, Orban has been emphasizing the shared, common commitment among Central European nations to border security. Now, of course, Prime Minister Orban made the whole notion of border security the centerpiece of his campaign. What we have to understand is that if you are going to protect a nation’s culture, customs, and traditions, you going to have to have – there is no way around this – you are going to have to have boundaries; you are going to have to have clear and unambiguous parameters and confines within which the nation’s culture, customs, and traditions can flourish. G.K. Chesterton once said that the whole purpose of rules and order is not to stifle but to allow good things to run wild, right? You cannot have a great soccer game without boundaries. You have to have border protection if you are going to have a vibrant and flourishing society, and all the nations of Central Europe are absolutely united in this, along now with Austria and it appears increasingly Germany. One way of thinking about this is that if you have open borders, you inevitably have open values. If you are not protecting your borders, you are inadvertently negligent about protecting everything within those borders. So the revitalization of Europe is going to require and necessitate an absolute commitment to the protection of each nation’s borders in order to protect and preserve the nation’s unique culture and identity rooted in a distinctively Christian vision of a flourishing civilization. First, we have a commitment to Europe’s classical and Christian roots; secondly, the protection of border and culture; and then, third, Orban sees economic nationalism as key to a European renaissance. Very simply put, here, economic nationalism is an economic approach that is intentionally pursued for the benefit of the culture, custom, and tradition that collectively comprise the nation. Economic nationalism is a facet of national identity, where certain kinds of cultures, traditions, religions, and ethnicities forge distinctive economic policies in accordance with specific national traits. And for Orban, this does not exclude the European Union necessarily, but what it does do is it requires that the European economy be decentralized away from Brussels, away from EU dictates. For example, Central European nations are supportive of putting together a European Monetary Fund to help nations hit by economic downturns and unemployment. And this is because it is believed that a European Monetary Fund would actually promote European sovereignty and self-reliance, and so even nationalist and populist movements within individual European nations are rather open and sympathetic to such a creation, the formation of a European Monetary Fund that can then be dispensed and spent at the discretion of individual nations. However, when it comes to just further centralizing power in Brussels like with a common euro zone budget and finance ministry like Merkel and Macron have been talking about, Central European nations are saying: Forget it, we do not want anything to do with it. Brussels has accumulated too much power, and as far as we are concerned, we are going to start the process of decentralization; and they believe voting as a block, creating a grand coalition of their own, is the primary way of accomplishing this decentralization. Of course, this decentralization will only empower and benefit each individual nation as part of their own individual revitalization, which will contribute to Europe’s renaissance as a whole. Whether this will involve the reintroduction of national currencies remains to be seen; I happen to think that it will, but time will tell on that one. Nevertheless, a European renaissance involves the decentralization of economic power away from Brussels and a return to economic nationalist policies that seek to harmonize economic interests with cultural and traditional faithfulness, the faithfulness in protecting the cultural identity of a nation. So there you have Orban’s threefold plan for European renewal; a return to Europe’s classical and Christian civilizational roots that reawakens a demographic spring from globalism’s reproductive decline, the protection of borders as indispensable to the protection of custom and culture, and the decentralization of economic power away from Brussels and returned back to individual nations as part of the restoration of national sovereignty and cultural prosperity. So do we stand at the verge of a European renaissance? Well, with leaders like Viktor Orban becoming more and more popular every day, I think we can say with confidence that such a renaissance has already begun.